Before you start discovery and installation, you must install and configure a master agent on a Windows machine in the company infrastructure. 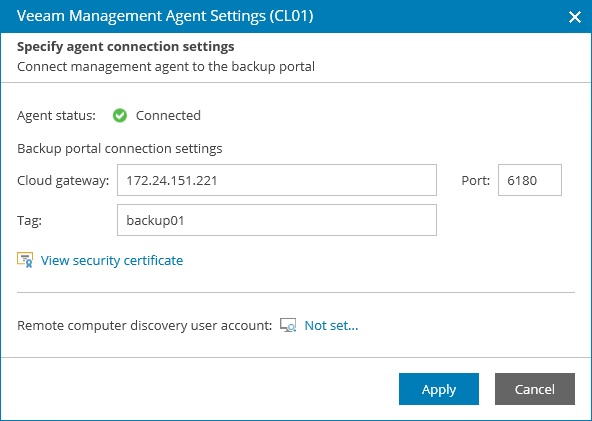 Obtain the management agent setup file. For details, see How to Obtain Management Agent Setup File. Make sure that the machine that will host the master agent has access to the Internet, and network access to all computers that you want to discover in the managed infrastructure. If you plan to discover computers using an Active Directory discovery method, make sure the machine that will host the master agent is part of a domain within which computers will be discovered. Copy the agent setup file to a location accessible from the machine where you want to install the master agent. In the icon tray, right-click the master agent icon and choose Agent Settings. In the Veeam Master Agent Settings window, specify settings that the agent must use to connect to Veeam Availability Console. When the agent connects to Veeam Availability Console, the status in the Management Agent Settings window will be displayed as Connected. The agent icon in the icon tray will turn blue. [Optional] Specify an account that will be used for computer discovery and installation of Veeam backup agents. If you do not specify an account at this stage, you will need to specify it when configuring discovery rules. In the Veeam Master Agent Settings window, click the Remote computer discovery user account link. 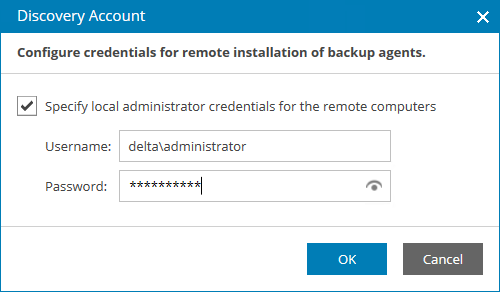 In the Discovery Account window, select the Specify local administrator credentials for remote installation of backup agents check box. In the Username and Password fields, specify credentials of an account that will be used to discover client computers and install Veeam backup agents. The account must have local Administrator permissions on all computers that you want to discover in the client infrastructure. In the Management Agent Settings window, click Close. If a company has more than one location, you must set a location for the master agent. By default, all new master agents you install belong to the default company location. If the master agent belongs to a non-default location, you must explicitly set this location for the agent. For details on setting locations, see Setting Locations.